Cape Town - Irish Rugby has written a letter to World Rugby expressing its concern at South Africa being recommended as hosts of the 2023 Rugby World Cup. 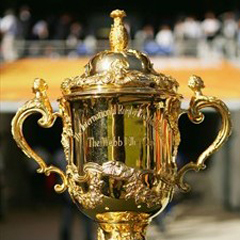 This follows last week's recommendation from World Rugby that South Africa be awarded the rights to host the showpiece. That recommendation was the result of an independent evaluation conducted by World Rugby, and while it does not guarantee South Africa the tournament just yet, it has left both Ireland and France less than happy. In a letter to World Rugby CEO Brett Gosper that was published in the Irish Times, IRFU Chief Executive Philip Browne requested that all World Rugby Council members be reassured that they can vote for whichever of the three potential host nations they prefer on November 15. That is the date when 39 votes will be cast by the World Rugby Council, with a simple majority determining the official hosts for 2023. World Rugby Council members are encouraged to consider the World Rugby recommendation when casting their votes, but they can still vote for whoever they like. Browne went on to suggest that there were concerns over South Africa's ability to ensure full stadiums throughout the tournament and he wanted to know why this was not reflected in the recommendation report. He then highlighted security, querying what mechanisms had been used in the recommendation to determine threat levels in the three regions. Finally, Brown pointed to the fact that there was no mention of South Africa's failed 2022 Commonwealth Games journey. The country had been awarded the rights to host the global event, but pulled out due to financial concerns. Browne wrote that he was surprised that World Rugby had not approached the Commonwealth Games Federation to obtain more information as to what transpired in South Africa eventually being stripped of the rights to host the Games.